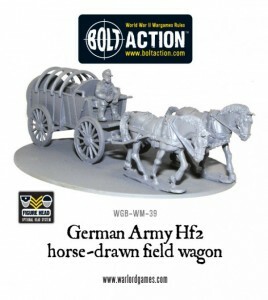 Warlord Games has released a new German Field Wagon for their Bolt Action line. Despite their popularity with gamers and photographers mechanised transport wasn’t as widespread as you’d think during World War II and the humble horse drawn wagons were still very much the order of the day for the German Wehrmacht. As such we’re pleased to be able to release this German Army light field wagon!